Cute Clay Wedding Cake Toppers Figurines, Custom cute Cartoon Figurine wedding cake toppers, you can choose any cartoon character, or any cute wedding cake toppers you can find anywhere, we will head to toe fully customize for you from photo provided. 100% handmade with light polymer clay, very cute and loverly wedding cake toppers to fit your wedding! 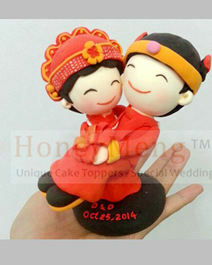 This customized clay wedding cake toppers figurines made by Wcaketoppers in Aug 2014, past example for your reference only, you can create your cute wedding cake toppers with your own design. Wecaketoppers team are very skillful and experienced in customizing such cute cartoon clay cake toppers figurines from photos provided, we can made any design cartoon cake toppers from your photos. The cake toppers are around 10 cm (about 4") tall. The base is around 5-7 (2-3")cm width. -- the clothing & pose you want us to made by providing photos / drawing, we will made from the photos and instruction provided as requested. -- the colour of the eyes. ---the colour of the hair. ---other details you want us to make. Our cake toppers will come with a base the same as the design you choose. if you want base with different shape / color, please tell us, we can make it for you without extra cost. We can also write your name or Initials on the base, such as "J&M Nov 20 2013" or "Matt & Ann 5 May 2014 ", this is free for you too!